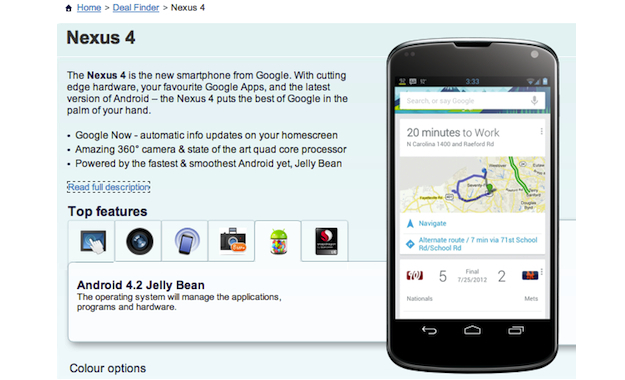 Check out our review of the Google Nexus 4 smartphone. The Nexus 4 has to be one of the most leaked smartphones of the year, and even now, just a few days before the event where it’s expected to be officially unveiled, it gets leaked again — this time by a retailer in the UK. Carphone Warehouse, an established and popular high street mobile phone shop, has put the Nexus 4 up for pre-order on its website, with a delivery date of October 30, the day after Google’s event. It provides just about all the specification details we could want, starting with confirmation of the 4.7-inch display with a 1280 x 768 pixel resolution and a pixel density of 320ppi, plus a quad-core, 1.5GHz Snapdragon S4 processor, which can also be found in the LG Optimus G and the Asus PadFone 2. 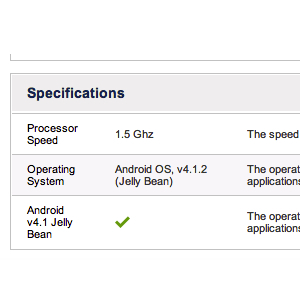 The operating system is listed as both Android 4.2 and Android 4.1.2, depending on where you take the information from on the site. These are two different things, as 4.1.2 has already been seeded to the Nexus 7, Galaxy Nexus and Nexus S, bringing with it only a few changes. Android 4.2 is listed separately, and several new software features that may or may not be related are talked about in the description, including a 360-degree photo mode and Gesture Typing, which sounds a lot like Swype. Continuing to explore the feature list, we find an 8-megapixel camera with 1080p video recording, 2GB of RAM, NFC, a forward facing video call lens and GPS. Although no weight is mentioned, the Nexus 4 is 9.1mm thick. Finally, the phone is shown to have just 8GB of internal memory and no microSD card slot, the combination of which could be a deal-breaker for many potential owners. No SIM-free price is given, although it’s available with either O2 or Vodafone from £31 per month, when the device itself will be free. LG’s name isn’t mentioned either, however the company is the only one listed under the “alternative phones” list. It’s now almost certain the Nexus 4 will be officially announced on October 29, but the question is, what else has Google planned for us?